Almost perfect. - Welcome to The City of Desire. Just the same, I think this picture of Lucas is pretty cute. Aren't his blue eyes pretty? XD All "pointed cats" have them--that is, cats with Siamese-style markings where the face is darker than the body. 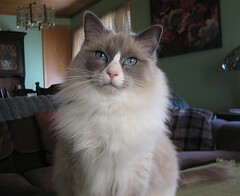 If Lucas had regulation blue-mitted Ragdoll markings, that white "blaze" on his nose would be a narrow hourglass or tear-drop shape and his nose would be dark gray, not pink.